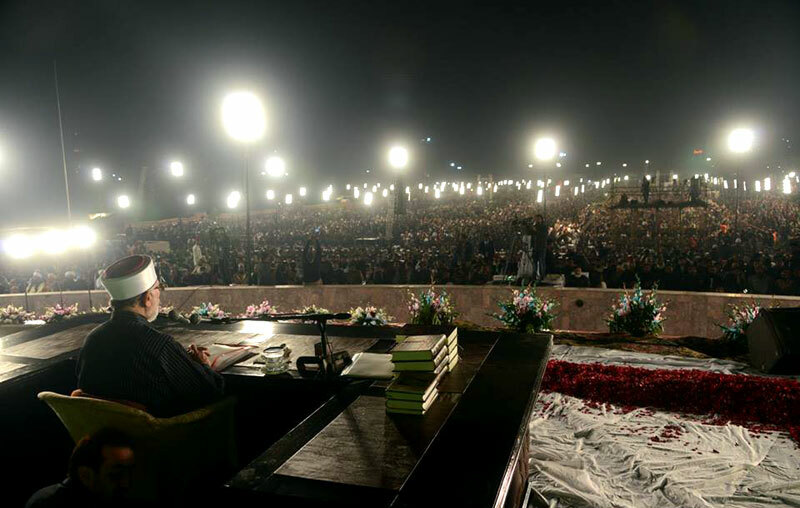 The 35th programme of International Mawlid-un-Nabi ﷺ Conference, the flagship event of Minhaj-ul-Quran International, was held on the night of November 20 at historic Minar-e-Pakistan. Founding leader of MQI Shaykh-ul-Islam Dr. Muhammad Tahir-ul-Qadri delivered his keynote address on the occasion. The proceedings of the Conference were broadcast live through Minhaj.TV. Hundreds of thousands of people belonging to various walks of life and different countries were in attendance of the mega event. Minar-e-Pakistan continued to reverberate with the passionate slogans of the faithful throughout the night. The participants stood up to express their extreme happiness as the hour of the Holy Prophet’s (peace and blessings be upon him) birth arrived. A large number of women belonging to Minhaj Women League were also present on the occasion, for whom separate seating arrangements were made. The youths belonging to MSM and MYL performed the security duties inside and around the venue. Renowned Naat Khawan had the honor of reciting Naat, which made the atmosphere electric. The leaders of Minhaj Ulama Council welcomed the respected guests who started arriving in the venue at 2 p.m. Arrangements of Milad feast were made for the participants from evening to 10 pm. Huge screens were put up for facilitation of the people.